Following continued user interest in the 1992 ‘Listed Building Repairs Notices’ research and guidance, produced by the IHBC’s predecessor, the Association of Conservation Officers [ACO], the IHBC has now made available online a digital edition on our Local Planning Authority (LPS) resource site – which including select updates of references – thanks to the efforts of the original author, now also serving as the IHBC’s research consultant, Bob Kindred MBE. Bob Kindred said: ‘Steady demand for copies of the publication subsequently appears to demonstrate the continuing relevance and value of much of the original research and guidance, particularly related to procedure and specification. The guidance retains it’s validity as the legislation has not changed in the interim, but the need to address the problem of historic buildings suffering from, or at-risk of decay remains an central heritage issue for appropriate heritage management. Furthermore, the procedural aspects and the detailed advice on specifying the content of the schedules for the full repair works contained in a Listed Building Repairs Notice continues to be as important a practical issue as when the report was first published. The genesis for the research stemmed from the author’s time as Borough Conservation Officer at Ipswich Borough Council where the first computerised local authority Buildings at Risk Register was piloted in 1986 with the support of the late Vanessa Brand, the Buildings at Risk Officer at English Heritage… and where it became readily apparent that data on the use of compulsory purchase powers for historic buildings was entirely lacking. Postal research was undertaken with the informal support of the Borough Council. This may help to explain the strength of the response to the questionnaire and an exceptional feedback rate of 97% from English local planning authorities. 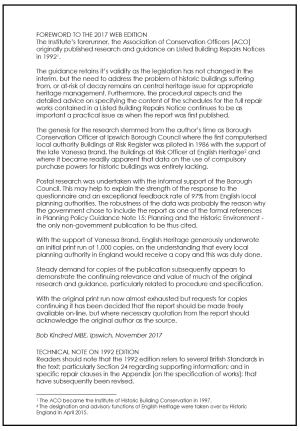 The robustness of the data was probably the reason why the government chose to include the report as one of the formal references in Planning Policy Guidance Note 15: Planning and the Historic Environment – the only non-government publication to be thus cited. With the support of Vanessa Brand, English Heritage generously underwrote an initial print run of 1,000 copies, on the understanding that every local planning authority in England would receive a copy and this was duly done. Steady demand for copies of the publication subsequently appears to demonstrate the continuing relevance and value of much of the original research and guidance, particularly related to procedure and specification. With the original print run now almost exhausted but requests for copies continuing it has been decided that the report should be made freely available on-line, but where necessary quotation from the report should acknowledge the original author as the source. Readers should note that the 1992 edition refers to several British Standards in the text; particularly Section 24 regarding supporting information; and in specific repair clauses in the Appendix [on the specification of works]; that have subsequently been revised….